Continue reading "The ❤️ of the matter: Here are too many words about Farhad Manjoo’s Twitter habits (and some cool charts)"
Nuzzel — the tweet-link-aggregation app that a certain kind of information consumer finds useful as an alternative to staring with horror into Twitter’s gaping maw all day — is now happy to take your money. This week, the company launched Nuzzel Pro, a subscription service costing $9.99 a month or $99.99 a year, that offers additional features. Right now, those features are a little thin — eliminating advertising (which the mobile app doesn’t currently have, but which is coming), allowing users to filter stories by keyword, and enabling a dark mode. Jonathan Abrams, Nuzzel’s founder and CEO, said additional Pro features would be added soon. Nuzzel’s core capabilities will remain free. 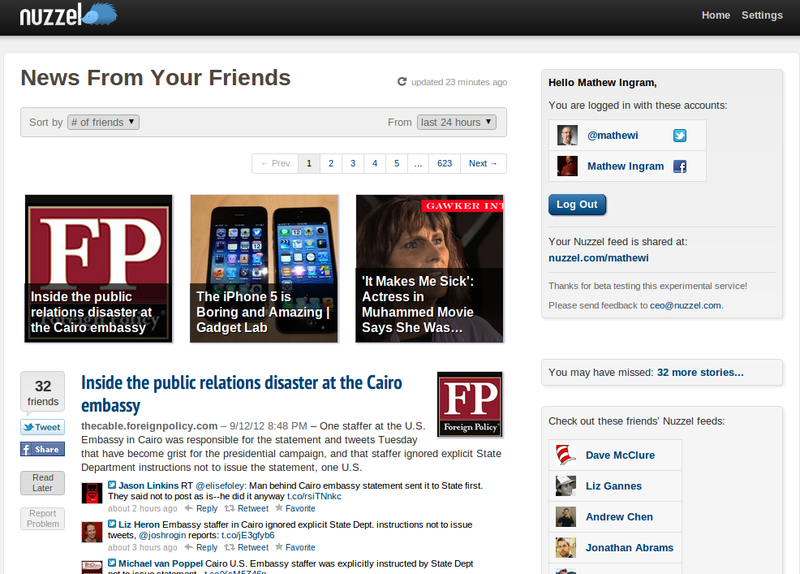 Users connect their Twitter and Facebook accounts to Nuzzel and can follow the stories that the people they follow are sharing most. Nuzzel also lets users subscribe to or create their own newsletters or feeds of Continue reading "You can now get a few additional features on Nuzzel for $100 a year"
The following piece is a guest post from Jonathan Abrams, founder and CEO of Nuzzel. Guest posts do not necessarily reflect the opinions of this publication. Read more about MediaShift guest posts here. There are billions of people who use email and read news online, but most of these people do not use any tool to filter the news and find relevant content. These people do not use RSS, Twitter, Nuzzel, Flipboard, or other social news apps — but they do use email. Contrary to what some people think, email is not dead. In fact, email newsletters are hotter than ever right now. Just a few days ago, Wired reported “Newsletters are, improbably, in vogue.” Other examples of this include “For Email Newsletters, a Death Greatly Exaggerated” from the New York Times and “The Triumphant Return of the Email Newsletter” from Harvard Business Review. Continue reading "How Publishers Can Drive Traffic with Email Newsletters"
I’m signed up for every newsletter imaginable, from New York Times briefings to Lena Dunham’s Lenny Letter to a newsletter targeted at teens to public media training newsletters to our own here at Nieman Lab (shameless plug: we have two options). I make it through a handful in the morning but can barely stomach more. The share-one-link-per-day company This.cm, which opened to all users last year after a period of invite-only incubation that left thousands of people clamoring for an invitation, is refining further its nightly email offering to stem the Internet firehose. Now the evening email delivered to This.cm users who have registered and are “following” other users — whether favorite writers or publications — will highlight links to stories shared by the people/publications users follow. At the moment, these are the most recent things shared in a user’s network that day, though according to Continue reading "This.cm wants to deliver the only links you’ll really read each evening"
Continue reading "Nuzzel rolls out automated newsletters to reach people who aren’t superusers of Twitter"
If you live in certain media and technology circles, there’s a very good chance you’re already using Nuzzel. It’s an app that combs through your Twitter or Facebook feeds, identifying the links being shared the most by your friends. (It’s a lot like our own Fuego, which does the same for future-of-news news with a slightly different methodology.) It’s a very efficient way to use the curation you’ve already done of your Twitter followers to curate news. It’s not limited to topics. It could be all the people who work at BuzzFeed or The New York Times, but topical ones work too. And when we built feeds like this, sometimes it surfaced content from niche vertical blogs that are not necessarily mainstream, but often, mainstream content was also surfaced. We quickly realized that every day The New York Times, USA Today, The Guardian, CNN, Washington Post, Wall Street Continue reading "Nuzzel, with a new batch of news-savvy investors, wants to bring social curation to publishers"
Even if he never achieves anything world-changing again — which he is certainly hoping to do — Jonathan Abrams will always be remembered as the guy who founded Friendster, the very first web-based “social network.” Launched in 2002, a year before MySpace and two years before Facebook, the site became a superstar among digital early adopters but lost its way and was overtaken by its younger competitors. Now Abrams is hoping to reverse that chain of events with a new startup called Nuzzel, a socially-driven news-filtering service he launched on Thursday. But while Friendster suffered from (among other things) being too early to the social party, Abrams’ new venture could suffer from the exact opposite problem: the social-news market is so saturated it may be difficult for Nuzzel to get much traction. Before he started Friendster in 2002, Abrams had a couple of earlier startups that were also early to their respective markets, including a social-bookmarking service called Hotlinks, which the Canadian-born entrepreneur started after working for Netscape in the late 1990s — but it launched five years before Delicious became the hot social-bookmarking tool, and it eventually perished in the dot-com crash. Abrams then launched an event-planning site similar to Evite called Socializr, but it too failed to get much traction and was eventually sold in 2010. Instead of checking out one of the other services that were trying to provide filters and recommendation services, such as Zite or Summify, Abrams — a programmer who got his start working for Canada’s famous Bell Northern Research labs — decided to just put together his own, and what became Nuzzel was born. Users log in with their Twitter and/or Facebook profiles and the system’s algorithms go through a user’s activity streams and pull out the news articles that have been shared or recommended by the most number of followers. The service also uses these semantic signals to generate recommended content that hasn’t been explicitly shared by anyone in a user’s social graph. In my initial use of the service, it came up with some good recommendations and some popular articles, and the site is well-designed and moves quickly — both of which are impressive, considering Abrams has no employees whatsoever, and put the entire site together himself. Users can filter the articles by time or by the number of friends who have shared them, and each post or article or piece of content comes with related tweets below it, any of which can be retweeted or interacted with. 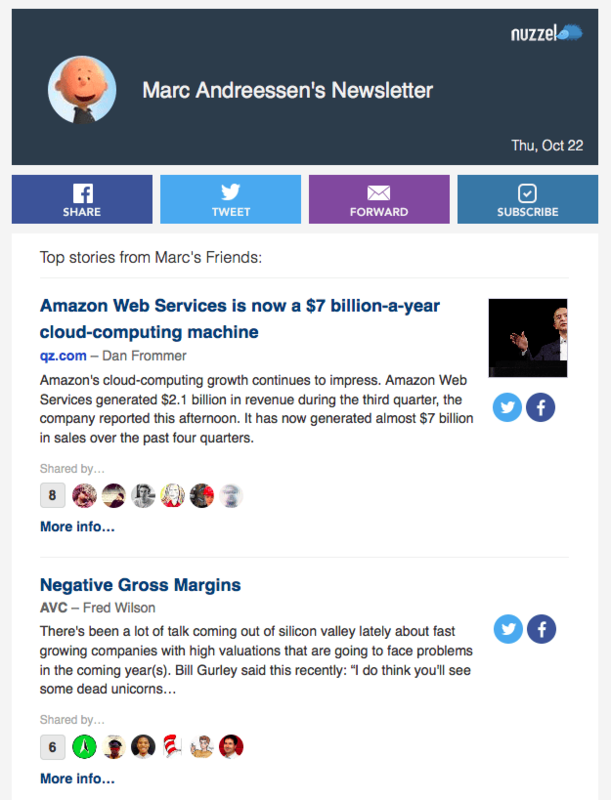 The most obvious use case for Nuzzel is the one that the tagline at the top of the service’s home page describes: “News You May Have Missed” — in other words, a catch-up tool for those who don’t have time to read everything. Abrams is right that this is a market that needs serving, but the challenge is that there are plenty of others already doing so: there are “personalized newspaper” services like Paper.li, apps like News360, Pulse or Zite, and even a service from the grandpa of social recommendations: namely, Digg, which was acquired by New York-based incubator Betaworks and merged with its News.me news-filtering app. Twitter has a stake in this particular game as well, after acquiring Summify, and there are newer dedicated filtering services like Nova Spivack’s Bottlenose and a startup called Prismatic. The Friendster founder says that he doesn’t want to take the route that some others have taken by trying to make the system too complicated — he says that he isn’t interested in “having it become some kind of PhD thesis in machine learning,” but simply wants to solve a problem for users in as simple a way as possible. And he says he hasn’t tried many of his competitors, apart from News.me (which he says he liked in many ways). “I’m just really focused on my vision, which I think is a little different,” he said, adding that he is hoping to raise some seed financing so he can hire some staff. The problem for Nuzzel, however, is that while Abrams may think his vision is a little different, the service itself looks very similar to about half a dozen other apps and services that do fundamentally the same thing, and in some cases have had months or even years to develop a following. That’s going to be a difficult thing to overcome, even for the founder of the world’s first social network.